I love Kaweco AL Sport fountain pens, and usually, have two of them on my at any point. I keep one tucked away in my Field Notes cover that is always in my back pocket. So when I saw the brass Delike pen, in a natural metal finish on eBay, I had to give it a try. 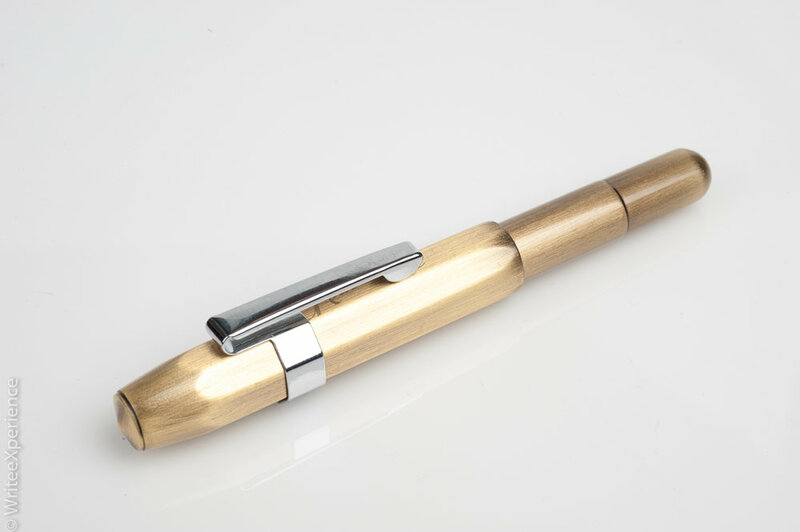 Delike is one of the new fountain pen makers that have gained popularity in the last year. For the inexpensive price (only USD 19 with free shipping), I did not feel like I could go wrong. I was not mistaken. 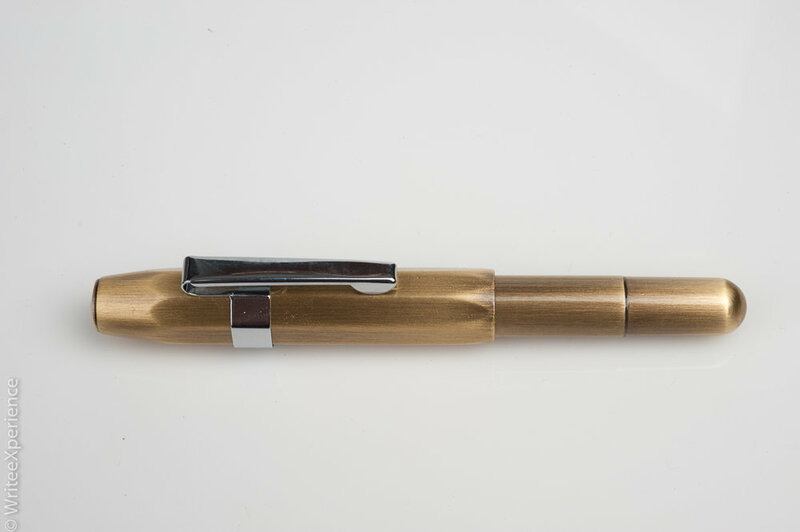 The Delike fountain pen is made from brass - which means it is heavy. This pen is noticeably heavier than my AL Sports and is also about a half inch longer. The brass is coated with a clear coat, which is excellent as it means no more stinky-metal hands. It comes in a gold/brass colour, which I believe is the brushed metal, though the clear-coat makes it hard to be sure that this isn’t a painted finish. The inside of the pen is a noticeably darker, raw material. The design of this pen is very similar to the Kaweco Sport, as you can see in the pictures. 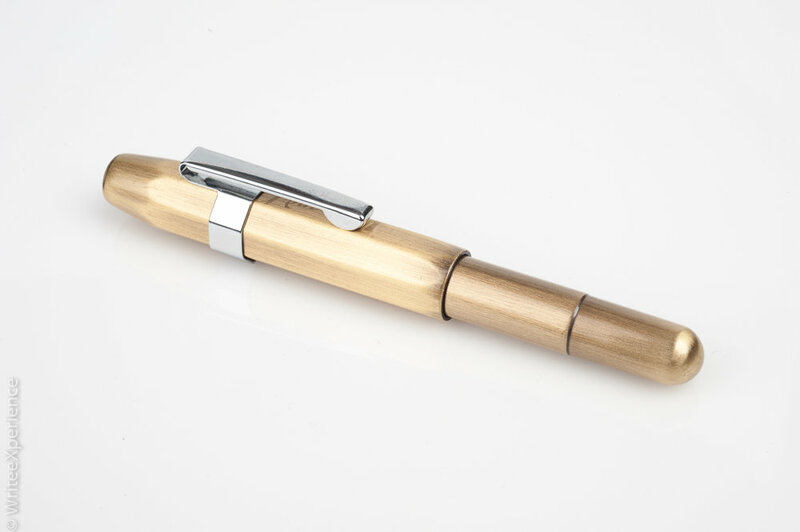 The hexagonal cap threads onto the body to close the pen and posts at a shallower depth using a friction fit to make a longer and more useable pen. It comes with a silver metal clip, which is good to hide the somewhat cheesy “War and Peace” engraving on the side of the cap. Unfortunately, the clip is pretty much useless, as it just slides off the coated finish of the pen if you try to clip it to anything. The surface treatment may be to blame for this, but it may also be that the pen is too heavy for a simple spring clip. With a heavy pen and a useless clip, you may think that I don’t like this pen as a cheap knock-off of the Kaweco. Surprisingly, nothing is further from the truth. This pen has a couple of advantages over the Kaweco, and one of them is enormous. As mentioned above, the Delike pen is slightly longer than the Kaweco. The extra 1/2” length isn’t enough to reduce the utility of the pen, as it is still short enough to fit in my pocket. But this extra length is enough for the Delike pen to house a full-sized ink converter. 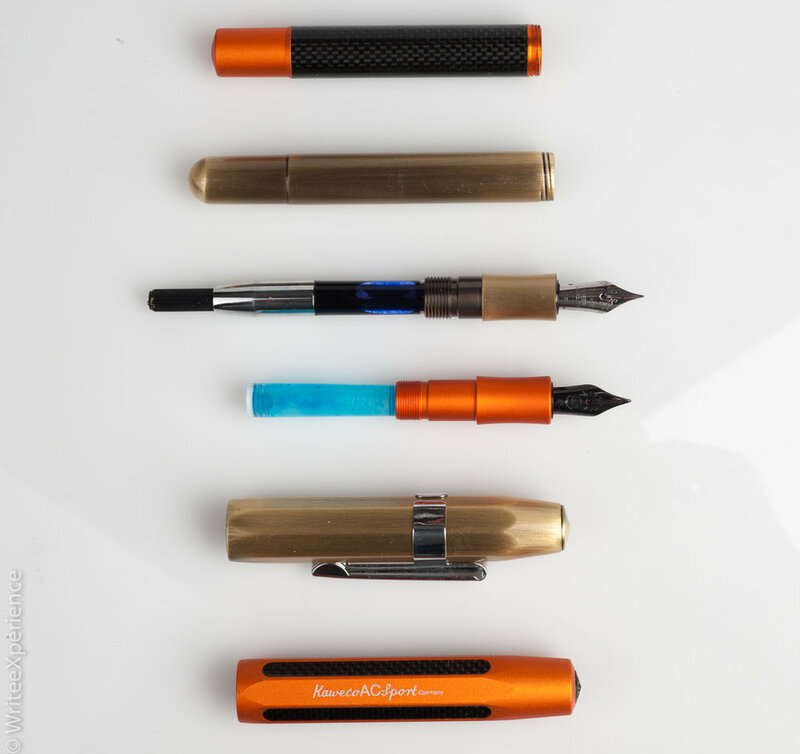 This is a huge design win, as it allows for me to use any ink I want, rather than be limited to either cartridges or the tiny plunger converter that is available for the Kaweco. And being full sized, it can hold enough ink to be practical. The other thing I really like about the pen is the Extra Fine steel nib. Out of the box, this nib wrote smoothly and with nice ink flow. 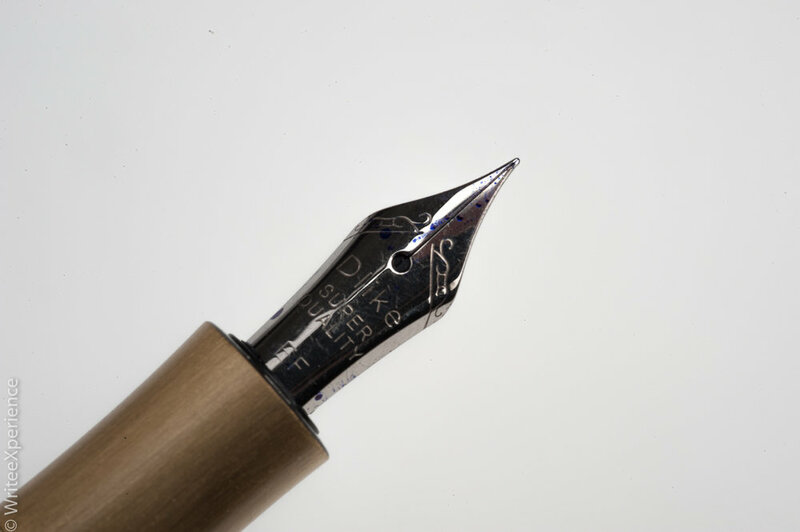 The nib lays down a very fine line - much finer than a Kaweco EF nib. As I use pocket pens in Field Notes, I like the finer line, which seems to be more of a Japanese grind than the wider European grind. I find the nib better than the Kaweco nibs, which is very impressive given the cost of the pen. I like this pen, despite the goofy logo and clip. I am okay with the weight for short writing bursts - which is what I generally use these pocket-sized pens for. I wouldn’t like to try a long writing session with this pen though. I believe Delike make a plastic version of the same design, in case you are intrigued and like a less heavy pen. The nib writing experience and the ability to use bottled ink is a huge advantage in a small pocket-sized pen.